In 2007, Akron Children’s Hospital featured Roxanne Bowers of East Palestine, Ohio, in one of its documentary-style TV commercials. The hospital’s Showers Family Center for Childhood Cancer and Blood Disorders had diagnosed Roxanne, then a 15-year-old high school sophomore, with Hodgkin’s lymphoma. She has been in remission for the past 2 ½ years, after receiving a combination of chemotherapy and radiation at Akron Children’s Hospital. Her dark, curly hair, which she lost while undergoing treatment, now reaches her shoulders. Roxanne, 18, says it’s even curlier than before she got sick. But while she may look like the same Roxanne to those who love her, she knows the experience has changed her. Spending so much time in the hospital has inspired Roxanne to pursue a career in nursing. She’s particularly interested in working in a neonatal intensive care unit, after her nephew’s stay at the Akron Children’s Hospital Beeghly campus. Now a freshman at West Virginia University, she’s well on her way. She’s already taken advanced chemistry, earning an impressive B grade. She’s also preparing for her first anatomy class. While most of her friends from East Palestine High School opted to go to Ohio State, Roxanne has wanted to go to WVU since she was in the seventh grade. 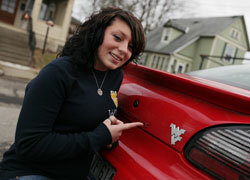 Her dad, Daniel, has lived in West Virginia for several years. She’s made lots of new friends and loves being a Mountaineer, cheering for her team at football games and just being part of the school community. Always looking toward the future, she plans to remain involved through the school’s active alumni association. But for now, she’s focused on her schoolwork and reaching the new goals she has set for herself. For this smart, hardworking young woman, the future couldn’t be brighter.